About the book: Sam and Holly Foster seemed to enjoy near-perfect lives. Each claimed a successful career and a legacy of goals set and achieved. Held above their possessions and accomplishments was their only child, James. He was the son they promised to raise together and the reason they came home each night. 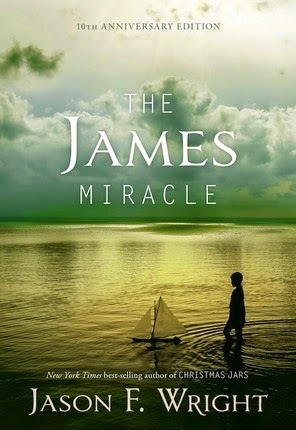 But when a series of events jolts the Fosters from their comfortable routine, it will take the miracle of their young son's toy boat and a mysterious stranger to remind them that heaven is not far and that love is never lost. My review: This is the only book of Jason Wright's that I hadn't yet read, in fact, I had never even heard of it when I was asked to do the blog tour. I love all of Jason Wright's books, he really has a way with making you care about the character. The way this book is written, I came to know and care about Sam, Holly and James in just a few short pages. So when tragedy hits their lives, it makes me sad. I loved this book, and I'm not ashamed to admit that the ending made me cry. I love the way that Jason Wright teaches a lesson through his books, he really is a master story-teller. This is a short, sweet story that you won't want to miss! About the author: Jason Wright is a New York Times bestselling author of Christmas Jars and The Wednesday Letters, and his articles have appeared in over fifty newspapers and magazines across the United States. A popular speaker, Jason has been seen on CNN, FoxNews, C-SPAN, and on local television affiliates around the country. Jason and his wife, Kodi, live in Virginia with their four children.